The University of Virginia’s University Singers are getting ready to join in the national and international celebration of the Centennial of Leonard Bernstein’s birth by presenting one of the American cultural giant’s most ambitious and acclaimed works. On Saturday, October 13 at 8:00pm and Sunday, October 14 at 2:30pm at The Paramount Theater, University Singers Director Michael Slon will lead an extraordinary cast of more than 150 singers and musicians in the regional premiere of Leonard Bernstein’s Mass. Tickets for this special production of Leonard Bernstein’s MASS are $37 gold circle/25 general/10 students, and are available at the Paramount Box Office. A limited number of free UVA student tickets will be available at the UVA Arts Box Office. All free UVA student tickets must be picked up at the box office by 5PM Thursday, 10/11. Leonard Bernstein’s Mass was commissioned by Jacqueline Kennedy Onassis to mark the occasion of the opening of the John F. Kennedy Center for the Performing Arts, and it made its world premiere there on September 8, 1971. The piece furthers Bernstein’s previous exploration of what he saw as a critical “crisis of faith” in the 20th century, and particularly in the aftermath of President Kennedy’s assassination and in the midst of the national unrest surrounding the Vietnam War. (This "crisis" is perhaps most simply explained as a crisis both personal and societal in which, to his view, human capacities and institutions for belief of any kind - Bernstein himself was Jewish - struggled to keep pace with the implications of modernity, and therefore, needed updating if they were to survive.) Mass follows his previous Symphony No. 3 Kaddish (1963) and Chichester Psalms (1965). This time around, Bernstein turns his sharp mind and all-encompassing musical vocabulary toward the ritual of the Roman Catholic Mass, questioning and challenging its tenets while taking audiences on an unforgettable and genre-spanning journey that goes from doubt and struggle to newfound and hard-won faith. “There is something powerful and transformative about experiencing this piece firsthand,” said Slon, who serves as conductor/producer for the production, and whose own experience conducting it as a graduate student at the Indiana University School of Music inspired him to make it a centerpiece of his thesis. Asked what audiences can expect from the production, Slon called it “unlike anything you have ever seen. It is a piece that defies description in terms of genre. It is part opera, part musical theatre, part dramatic theological play, and part ritual.” The production, he said, will feature an orchestra, three choruses, and dancers, with more than 100 being UVA students and faculty, and the rest comprised of community members, including members of the DMR Youth Chorus. The University Singers is the flagship chorus at UVA, and recently gave acclaimed performances of Handel’s Messiah, Poulenc’s Gloria, Beethoven’s Symphony #9, and Bach’s St. John Passion in Charlottesville. In the past few years, the group has also sung for Les Misérables creators Claude-Michel Schönberg and Alain Boublil during their UVa residency, performed before 20,000 at the 2017 UVA Bicentennial Launch Celebration, and taken a two-week concert tour of England, the Czech Republic, Poland, and Austria. Founded in 1957, the group performs a cappella and accompanied choral literature ranging from chant to major choral-orchestral works, and the works of contemporary composers – including premieres of works by Stephen Paulus, Forrest Pierce, Judith Shatin, and Eric Whitacre. Recent United States tours have taken the group to Atlanta, Boston, Buffalo, Charlotte, Charleston, Chicago, Cincinnati, Nashville, New Orleans, New York, Orlando, Philadelphia, Providence, and the National Cathedral in Washington D.C. For more information visit: http://music.virginia.edu/usingers. 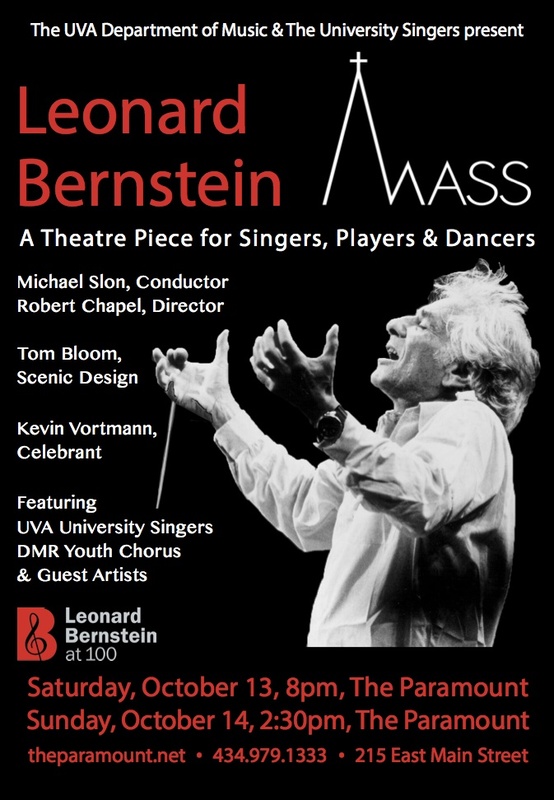 Leonard Bernstein’s Mass is sponsored by the UVA Department of Music, the University of Virginia’s Office of the Provost and Vice Provost for the Arts with support from the Arts Endowment, the UVA Parents Fund, The UVA Arts Fund for Artistic Excellence and Cary and Laurie Turner. View the University Singers new promotional video. This event has also been featured at the Daily Progress. To read the full text of Bernstein's Mass, CLICK HERE. To see a PDF of the program for this concert, CLICK HERE.